Sean and I take great pride in our community. We love working with Rhode Island businesses and homeowners and once in a while, a project comes along that is very meaningful to us. 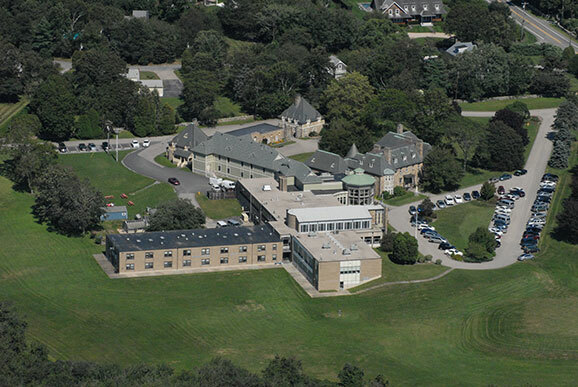 One of these projects was the construction of the outdoor recreation area for Ocean Tides School in Narragansett. Ocean Tides offers opportunity and guidance for thousands of young men in Rhode Island. The school and residential program provides a challenging, safe, and healthy learning environment designed to meet the social, emotional, behavioral, and intellectual needs of each individual. In celebration of its 40th anniversary, Ocean Tides sought to create a modern, contemporary area for outdoor relaxation and recreation. Previously, there was no outdoor space specifically designed or developed for the student residents at Ocean Tides. The new space would include a basketball court, volleyball court, and outdoor cooking area. Thanks to fundraising efforts and the support of community members, Ocean Tides reached its goal, and construction began during the fall of 2016. Our neighbors at East Coast Construction were brought in to install a basketball court, beach volleyball court, and picnic tables. 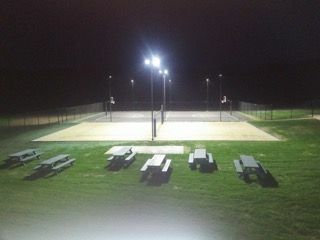 They graded the land and then called on Griff Electric to install outdoor LED sports lights. We installed 8 high-efficiency outdoor LED sport lights, ensuring safety and maximum visibility on the premises. It took two of our crew members four days of work to complete the installation. The outdoor recreation area was completed on October 1, 2016, when students, faculty, and community members came together to celebrate the new, state-of-the-art space. We are thrilled to play a part in providing this outdoor space for the young men at Ocean Tides. Being able to make safe, meaningful outdoor activity possible is something that touches our hearts. Outdoor activity is an important part of healthy development and crucial for wellness. We believe everyone should have a safe place to play. Griff thanks East Coast Construction, as well as the community, for helping to make this 40th Anniversary Project possible.